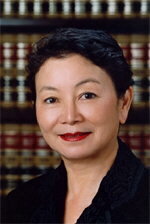 LOS ANGELES—Associate Justice Kathryn Doi Todd, of the Court of Appeal, Second Appellate District, Division Two (Los Angeles), will retire from the bench on January 22, 2013, after 35 years on the bench. Appointed by Governor Jerry Brown to the Los Angeles Municipal Court in 1978, Justice Todd was the first Asian-American woman judge in the country. Before her appointment, she conducted a general civil practice in Los Angeles, in Little Tokyo. In 1981, Governor Brown appointed her to the Los Angeles Superior Court where she served as presiding judge of the Juvenile Court from 1988 to 1989. She was appointed to the Court of Appeal by Governor Gray Davis in 2000. “Having served on courts with Justice Kathryn Doi Todd for almost 35 years, I am saddened because the judicial system is losing a person of great intelligence, charm and wit, and I will no longer be working with a dear friend,” said Justice Robert Mallano, the presiding justice of Division One of the Court of Appeal, Second Appellate District. After being interned with her family during World War II, she returned to Los Angeles where she attended public school, graduating from Los Angeles High School in 1959. She graduated from Stanford University in 1963 with a degree in history, and then attended Loyola Law School on an academic scholarship, graduating with honors in 1970. She was honored as a Loyola Law School Distinguished Alumna in 2003. Justice Todd has served on various committees and organizations created to improve the administration of justice, including the California Judicial Council, the policymaking body for the state courts. She has also served as chair of the Judicial Council’s Appellate Advisory Committee and as a trustee of the California Judges Foundation and the Los Angeles County Law Library.